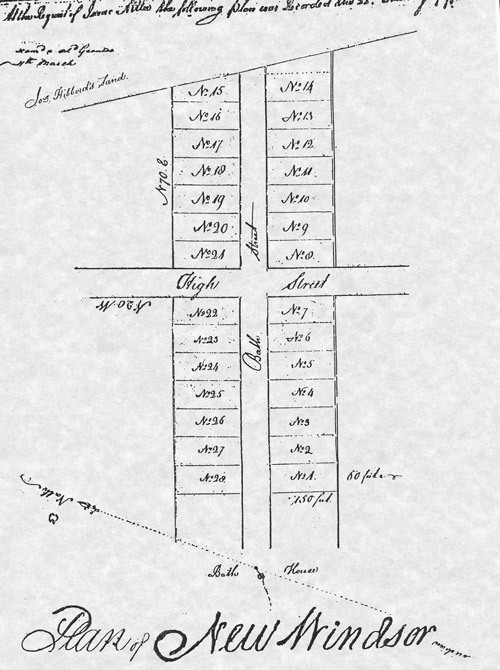 This image of Isaac Altee's 1796 Town Plan provided by the New Windsor Heritage Committee. The railroad arrived in 1862, and New Windsor really began to prosper with a variety of new businesses sprouting up, including a foundry, a cannery, and an ice cream factory. Now farmers and merchants could move their products faster and to markets farther away, and shop keepers could receive merchandise more quickly from the big cities. Greater numbers of city residents came by rail to escape the summer heat and soak up some of the health-giving waters at the spring. In 1863, New Windsor had some first-hand experience with the Civil War. On June 30, 5,000 Union cavalrymen rode through town on their way to Gettysburg for an epic battle. The next year on July 9, the town was over-run by 500 Confederate cavalry who looted many of the stores for provisions and stole much-needed horses. One of the most notable structures in town is the 10,000 square foot, 42 room Dielman Inn at High and Main Streets. It was a popular gathering place for vacationers from the 1870s through its closing in 1927. In its prime, the inn became a regional cultural magnet, and this also served to attract visitors. The proprietor was Louis William Dielman, a former professor of music at Calvert College in town. He delighted in sponsoring after-dinner concerts, musicales, lectures, skits and tableaux featuring guests who hailed from as far away as New York. For years, a regular visitor was retired Brigadier General Marion P. Maus, a Congressional Medal of Honor winner who was credited with the capture of Geronimo in 1886. The town is proud of its unique architecture. Elegant, stately homes sit at the top of Church Street, originally called Quality Hill. There you will find houses constructed in the Colonial Revival, Classical Revival, Queen Anne, and Bungalow styles. Two notable American artists once called New Windsor home. Frederick Dielman (1847- 1935) was once President of the National Academy of Design and created many illustrations, including those for editions of poetry by Longfellow and Hawthorne. He also produced designs for two mosaic panels in the Library of Congress. Clyfford Still (1904-1980) was an internationally known abstract expressionist painter. The U.S. Post Office issued a stamp in his honor in 2010, and Denver, Co. has a museum dedicated to his works. In 2016, one of Still’s canvases sold at auction for $28.1 million. New Windsor also has a history of higher education. The Catholic-based Calvert College began in 1850, although it was temporarily shut down when it lost both teachers and students to fight during the Civil War, primarily for the Confederate cause. The oldest standing college building in Carroll County is Old Main, built in the High Italianate style in 1849. The college was taken over by the Presbyterian Church in 1872 and the name was changed to New Windsor College. Blue Ridge College, which was located in neighboring Union Bridge, bought the property in 1912 and operated a Church of the Brethren-affiliated school there until 1937. It was then sold to a private corporation to administer, but closed in 1943 because of financial difficulties. The Blue Ridge College property became the New Windsor Service Center in 1944, notable for its relief efforts to a ravaged Europe after World War II and since. The Center’s works included refugee resettlement, disaster relief, and the famous Heifer Project, which once helped restore Europe’s devastated livestock. In 2001, President George W. Bush visited to pay homage to the Center’s charitable contributions over the years and around the world. Today, New Windsor continues to honor its history and preserve its small town atmosphere, while welcoming new families as it moves into the 21st century. The town prides itself on exhibiting the same charm, appeal, and promise it enjoyed more than two-hundred years ago. A military road connecting Washington D.C. to Buffalo, New York was constructed through Town. Many Town citizens contribute to the construction of the Union Chapel, where all denominations could worship. As Carroll County is created, the New Windsor area is incorporated into the County. New Windsor Presbyterian Church was organized. St. Paul’s Methodist Church was built. The Town of New Windsor was incorporated. Calvert College was founded (current site of The Brethren Center). Strawbridge United Methodist Church was built. Throughout the early history of the New Windsor area, the Town shifted frequently between counties. The New Windsor area was incorporated into Charles County in 1658, but in 1694 the area was transferred to Prince George’s County. In June of 1748, the area then shifted to Frederick County. Not until 1837, when Carroll County was created, was it incorporated into Carroll.